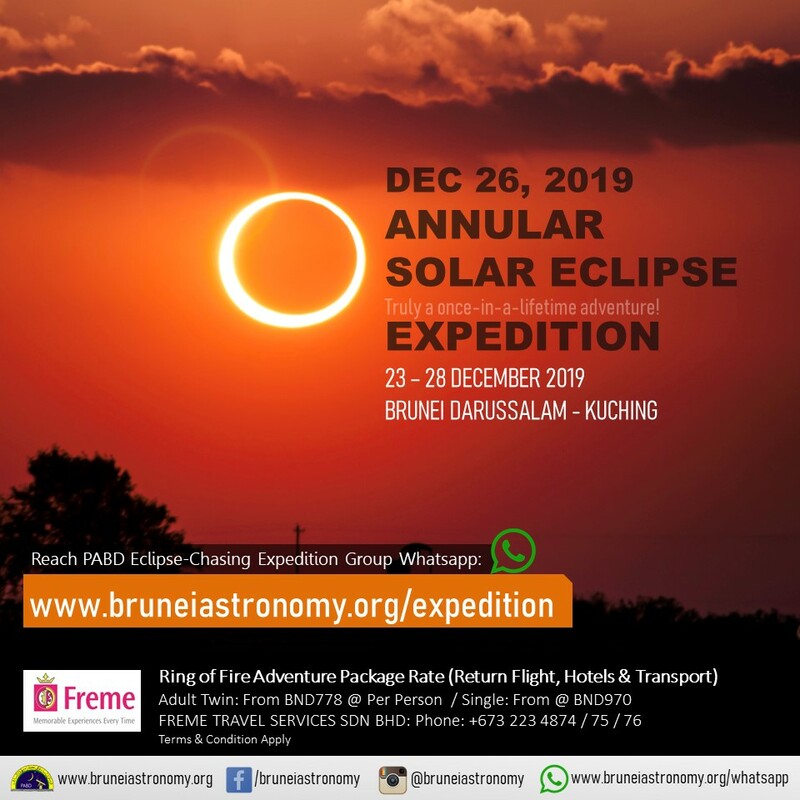 Bandar Seri Begawan – On Dec 26, 2019, an annular solar eclipse will occur from few cities in Borneo, on the narrow track of the Moon shadow. 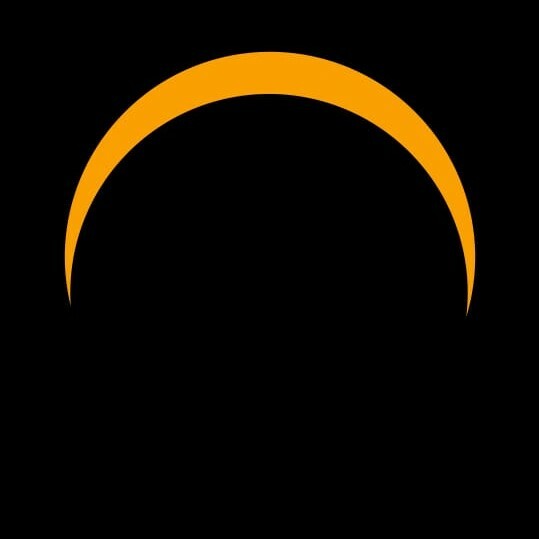 Yes you have you be along the eclipse path to witness this special kind of eclipse of the sun – and we will bring you there! 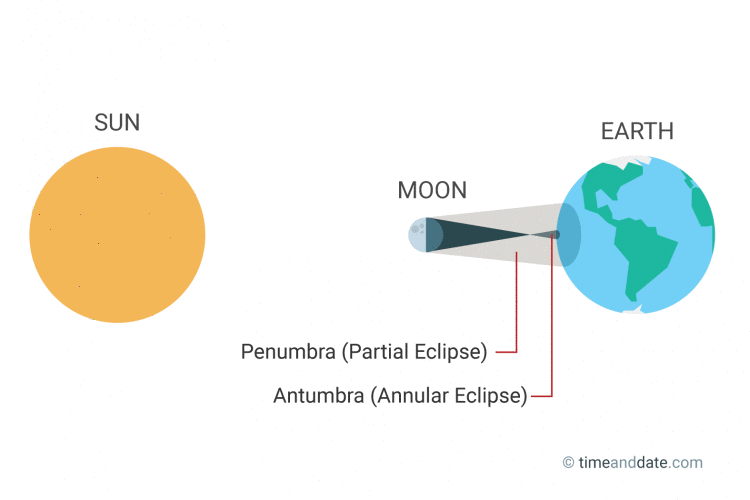 The celestial alignment happens when the moon passes in front of the sun, but the orbit of the moon is a little further away from the Earth and the moon does not completely cover the sun. 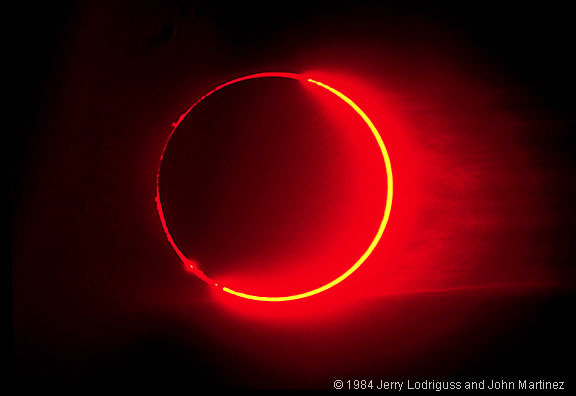 It will be a very spectacular sight, when a “ring of fire” or annulus surrounds the sun at central eclipse. Watch a “string of beads” (Baily’s Beads Effect) on the edges of the sun during the beginning of annularity eclipse. As the horizon darkens to deeper blue than normal, observe the animals reacting to the dramatic changes in the sky. Look for the brightest planet, Venus, shining east of the sun at mid-eclipse. 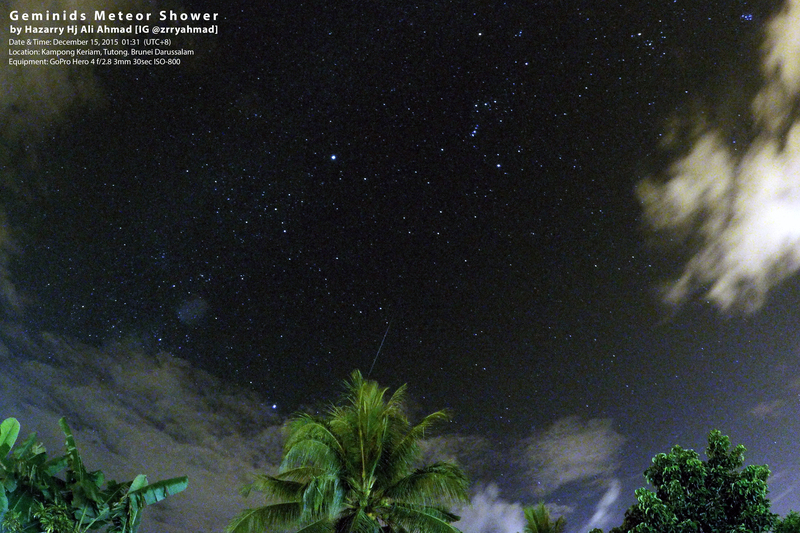 Jupiter, Saturn and Mercury are up there too, but they are fainter and so will be harder to see. 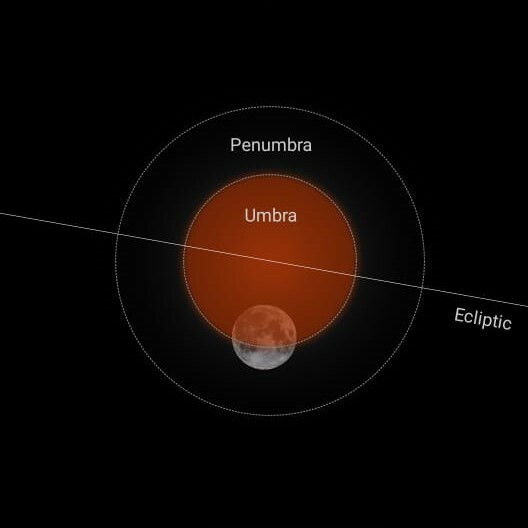 This is a rare celestial event as the next annular eclipse will take place in Borneo in 2031. The visible surface of the sun in a fiery ring around the moon can still blind you. So be sure to watch indirectly, or with special filters. Do not look at the sun directly without eye protection at any time during this eclipse. PABD will provide each member with an eclipse glass (included in your package) for this expedition. Bandar Seri Begawan – First time ever Meteor Shower observation in Brunei Darussalam! 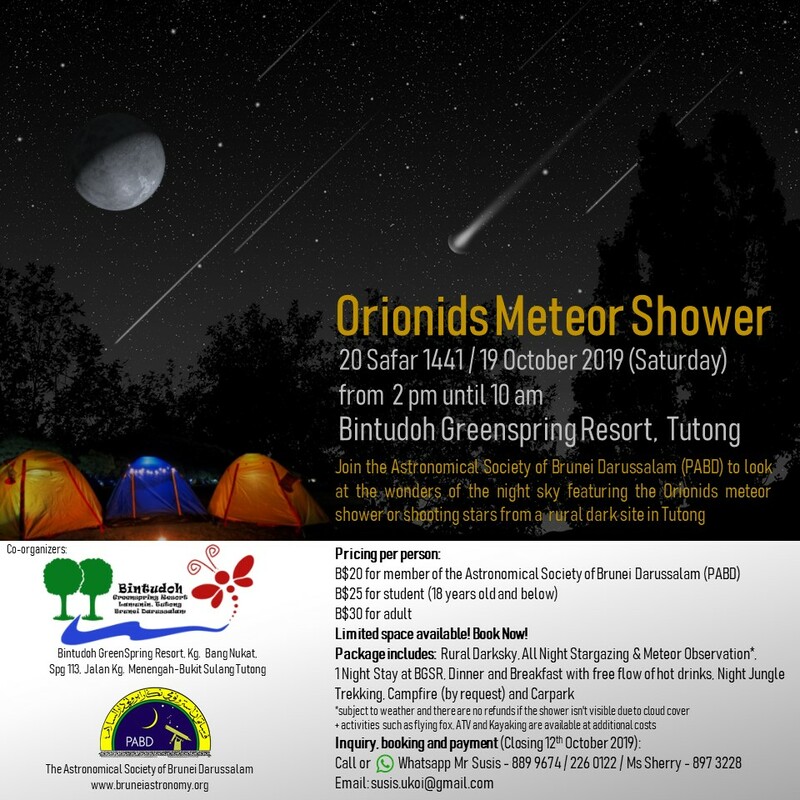 Capture the dazzling Orionid shooting stars on October 19, 2019 at Bintudoh Greenspring EcoResort, a rural dark site in Tutong. Astronomy enthusiasts are welcome to join, and to note that space available are limited – Book Now! If you are a high-school or university student, The International Astronomy and Astrophysics Competition gives you the unique opportunity to unleash your science skills and to apply them to challenging problems. Participants receive certificates, awards, cash prizes, global recognition, and more! Qualification Round has opened! Deadline: 14. 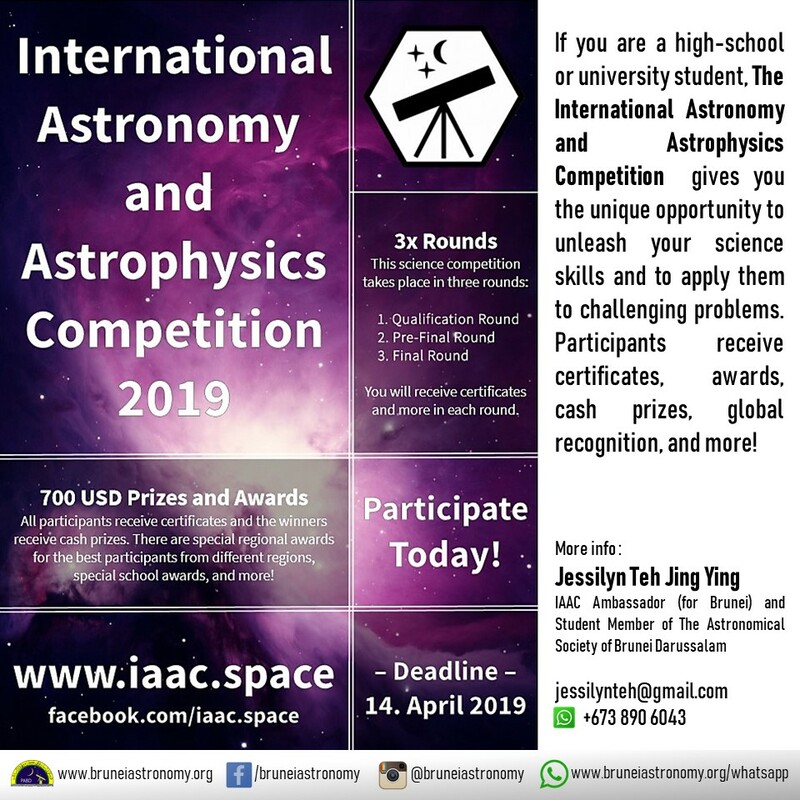 April 2019 – Use your astronomy skills and participate to win cash prizes and certificates! Supermoon, Full Moon, Equinox? Check out this space infographic below for explanation. 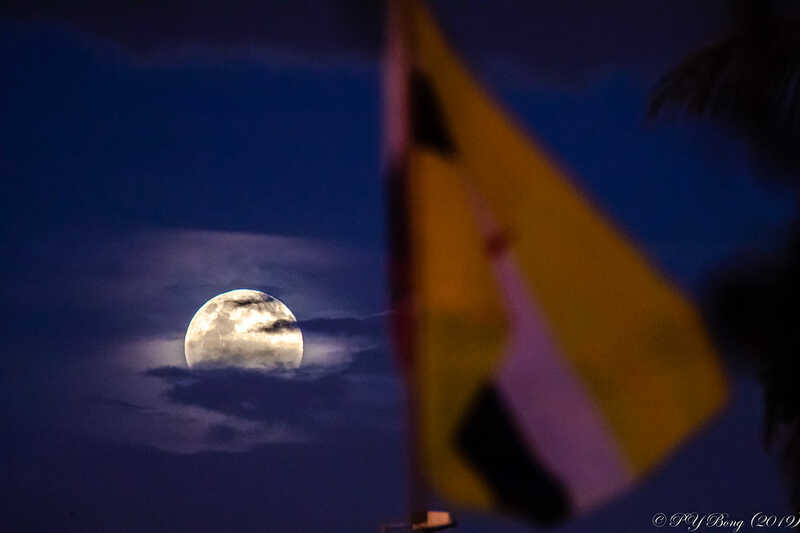 Catch the ‘Super Equinox Full Moon’ visible the whole night from Brunei Darussalam on 20th (Wednesday) and 21st (Thursday) March 2019. 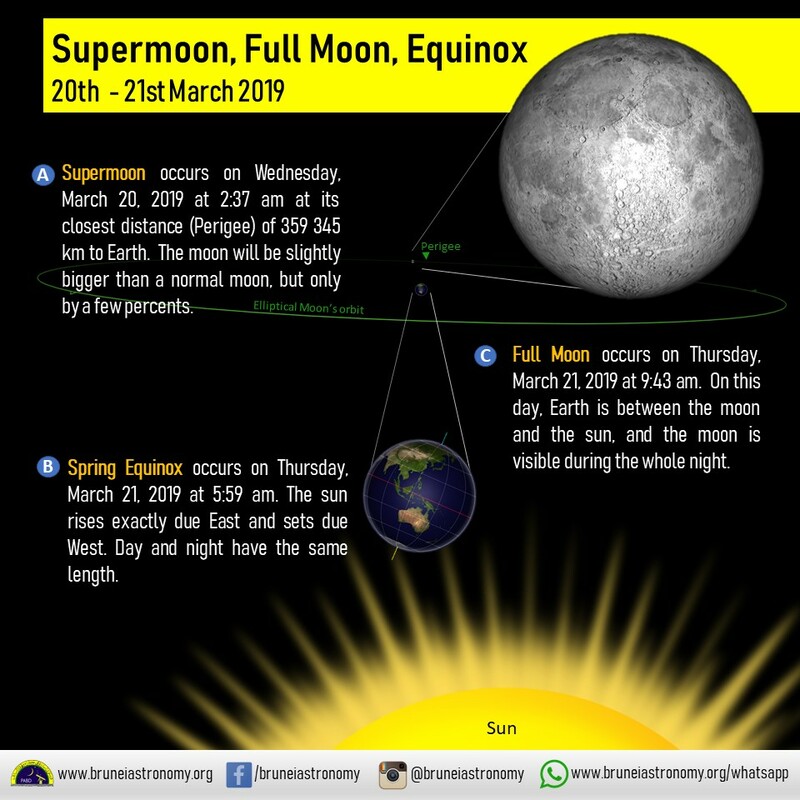 Supermoon occurs on Wednesday, March 20, 2019 at 2:37 am at its closest distance (Perigee) of 359 345 km to Earth. The moon will be slightly bigger than a normal moon, but only by a few percents. Spring Equinox occurs on Thursday, March 21, 2019 at 5:59 am. The sun rises exactly due East and sets due West. Day and night have the same length. 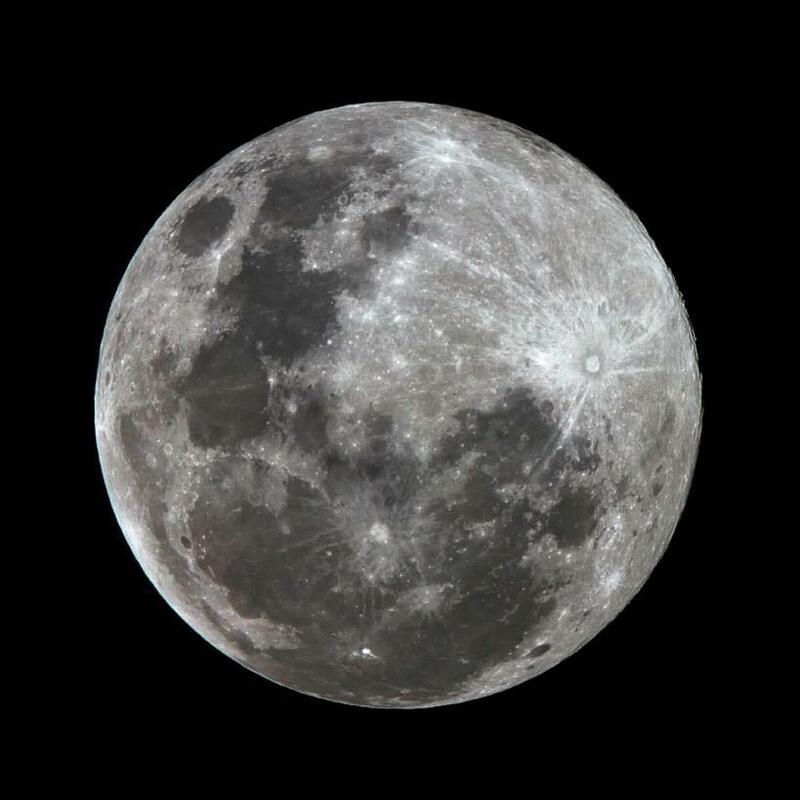 Full Moon occurs on Thursday, March 21, 2019 at 9:43 am. On this day, Earth is between the moon and the sun, and the moon is visible during the whole night. Pusat Kepimpinan dan Pembelajaran Sepanjang Hayat, Universiti Islam Sultan Sharif Ali (UNISSA) sedang menjalankan kajiselidik yang bertujuan untuk mengenalpasti keperluan dan permintaan orang ramai terhadap kursus Sijil Falak Syari’e. Setiap maklumat/butiran yang diberikan adalah SULIT dan akan dirahsiakan serta digunakan untuk tujuan kajian sahaja. 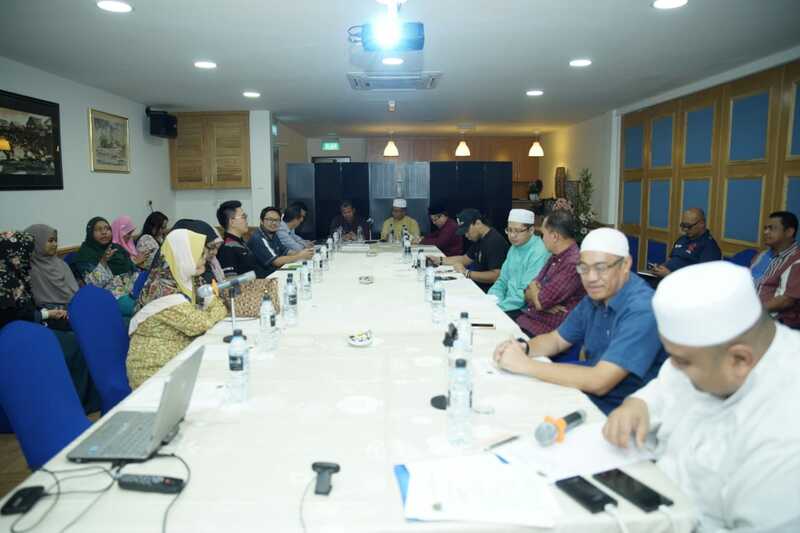 Dengan ini dimaklumkan kepada semua ahli-ahli PABD dan orang ramai yang berminat untuk menjadi ahli PABD bahawa Mesyuarat PABD 1/2019 akan bersidang pada bulan Mac tahun ini. Agenda Mesyuarat telah dihantar melalui e-mel setiap ahli. Bandar Seri Begawan – A perfect alignment of the Earth-Moon-Sun bodies will occur on December 26, 2019, resulting in a spectacular annular solar eclipse visible in few cities of Saudi Arabia, India, Sri Lanka, Sumatra, Borneo and the Pacific Ocean . As seen from a location on Earth, a solar eclipse happens when the moon moves in front of the Sun thus block the Solar disk. 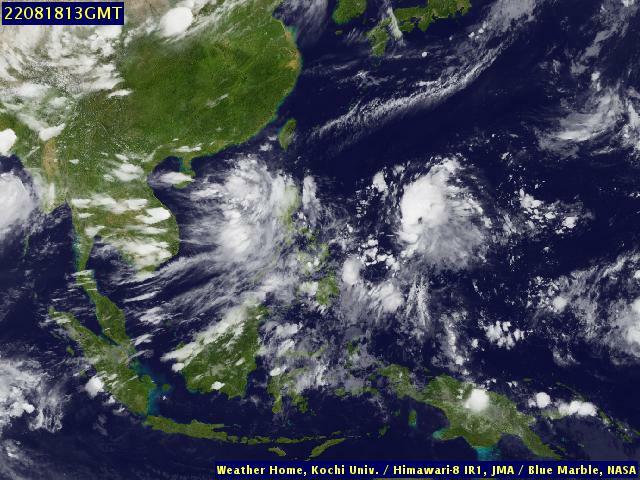 It is a mere miss, as people in Brunei will only see a partial eclipse with 85.8% obscuration of the Sun by the Moon. A simulation of the partial Solar Eclipse as seen from Brunei during mid-day is shown in the video below. 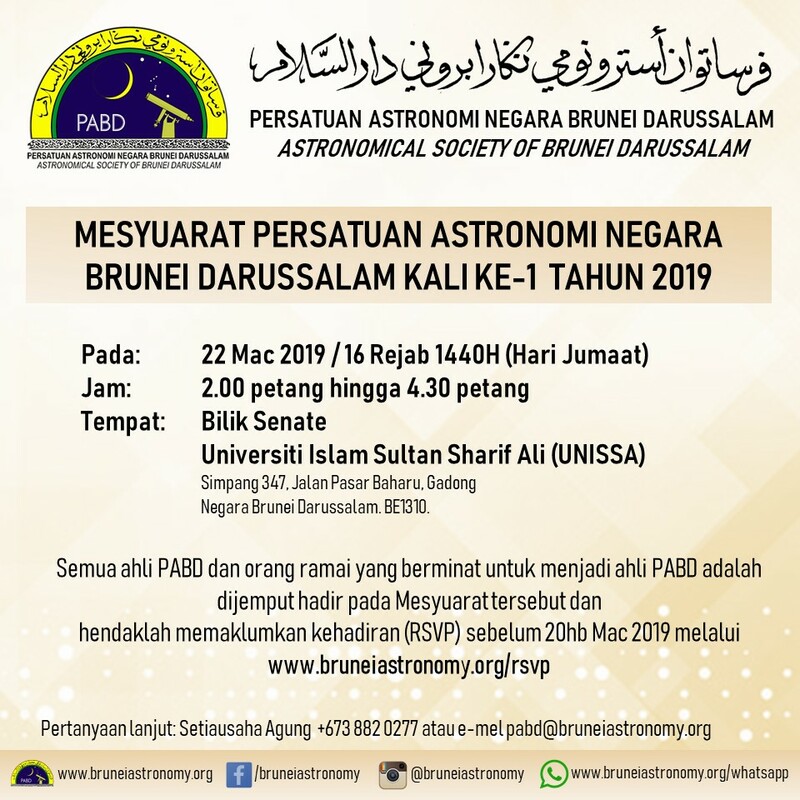 Since people in Brunei will only witness the partial obscuration of the sun by the moon, features that are normally visible during annular eclipse such as ring of fire and darkening of the sky/surrounding will not be observable from Brunei. 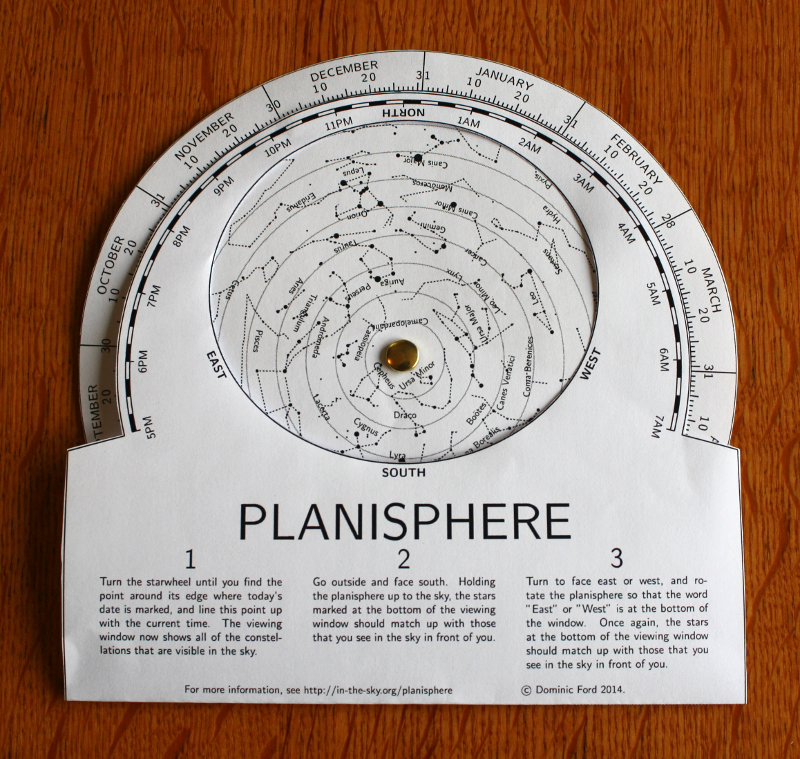 A planisphere is a simple hand-held device which shows a map of which stars are visible in the night sky at any particular time. 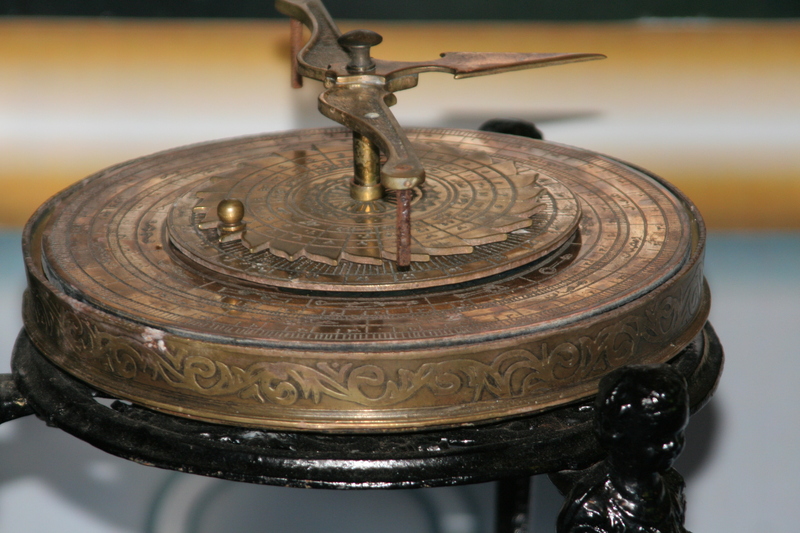 By rotating a wheel, it shows how stars move across the sky through the night, and how different constellations are visible at different times of year. 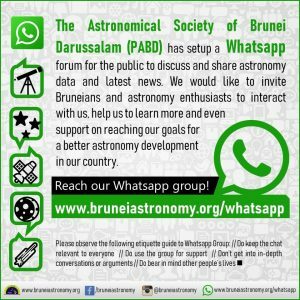 On this web page, a kit which you can download and print to make your own planisphere (for Brunei Darussalam) out of paper or cardboard. 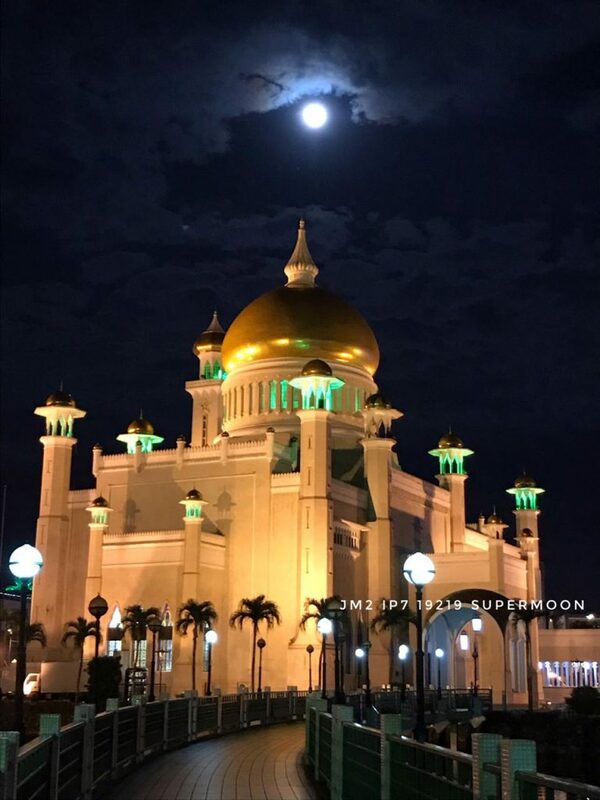 Bandar Seri Begawan – An unusual full moon light “hypnotised” many skywatchers to a rare celestial display around the world including Brunei Darussalam on Tuesday night, 19 Feb 2019. The super moon was the biggest and brightest in 2019 because its orbit is at its closest to earth or at perigee at around 356,800km. At such shortest distance, the Earth’s only natural satellite appeared nearly 30% brighter and almost 14% bigger than a typical full moon. Some effects of the moon’s gravitational pull at our oceans was more pronounced than other times of the month, generating higher than normal high tides or Spring Tides. Below, some of the best shots of it from around the Sultanate.